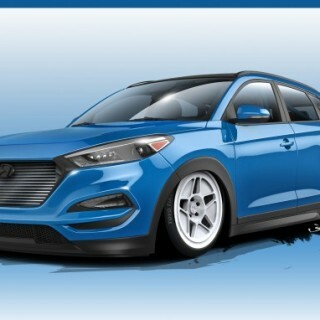 Tricked out Hyundai Tucson crossover vehicle photos & news. The Frankfurt Auto Show is now done, but that means we can now look forward to the next big event on the automotive calendar, the 2015 SEMA Show. 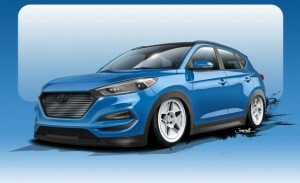 While many automakers are keeping quiet about their plans for the show, Hyundai have already announced that they will be showing off what is being described as the most powerful Hyundai Tucson ever built. 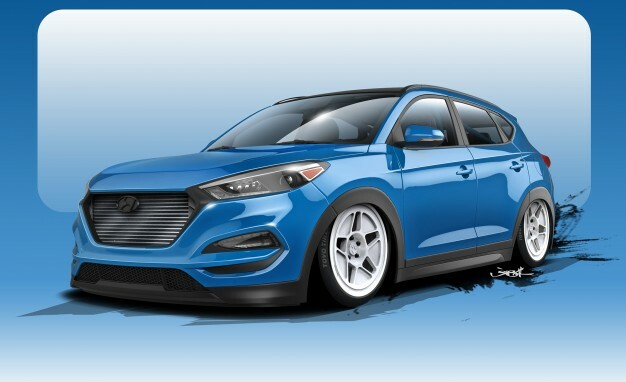 This is the 4th straight year that the companies have partnered together, and they will be showing off their latest creation at Hyundai’s SEMA press conference on November 3 at 11:30 a.m. PT, in Las Vegas. The starting point for the Tucson Brute Ute is Hyundai’s 2.4-liter Theta II engine. Much like they did with the Hyundai Sonata, Bisimoto used fast-burning flex fuel and a high-boost turbocharger to upgrade the engine management system, with the ends result being a 700-hp unit that uses a 6-speed manual transmission. The goal with this build was to create the ultimate in power and performance, all wrapped up in a pretty unexpected package, which just happens to be the Tucson platform. The Brute Ute is about more than just what is under the hood, though, and Bisimoto are proving that with their other additions. The vehicle gets white 5-star race-spec wheels, custom air-ride suspension, and a roll-cage that clearly indicates that this is a performance vehicle. To finish things off, Bisimoto decided to replace the standard front grille with a huge intercooler that will cool down the incoming air. Bisi Ezerioha, owner and chief engineer, Bisimoto Engineering, said that the popularity of the CUV market made the 2016 Tucson the perfect platform for this year’s custom build. He said that hundreds of hours had been committed to engineering and testing the engine components. He is confident that what they have made is a unit that can definitely handle the power it is expected to deliver.